Purchase Arction products through the secured connection from Share-it e-commerce solution. One separate license is purchased per each developer working with LightningChart .NET. Single developer licenses are perpetual, which means that you can use the components indefinitely. When your initial subscription of 1 year or 2 years is expired, the license and all your applications keep working. You can continue developing with the latest LightningChart version released before the expiration date. Expiration ends technical support, updates and warranty. These services are extended by purchasing a Subscription Renewal for a special price. Get one of the Packages with a preset combination of Features for a favourable price. 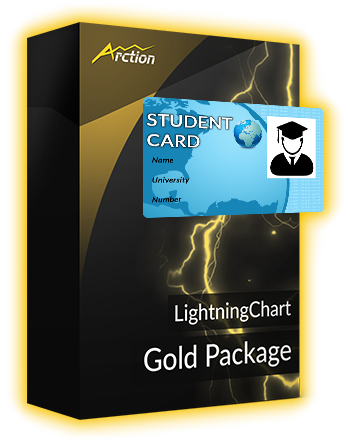 Subscription Renewal assures that you continue to receive professional technical support, as well as important updates and new versions of LightningChart. Source Code for LightningChart allows deep interaction with the library, complete flexibility and full customizability of the components. Download the full price list as pdf. Adding a new Feature to a subscription costs the price of this Feature as presented in the table above. Can be installed and used by several developers on multiple machines. One developer can use a floating license at a time. This license costs 2.5 x equivalent single developer license price, and is granted for a selected period. Site License enables usage of LightningChart .NET by an agreed count of direct LightningChart developers and co-developers within one team. Ask pricing from sales@arction.com.